A few weeks ago we finished up the majority of the renovations in our banquet facility. So far they have been met with rave reviews. 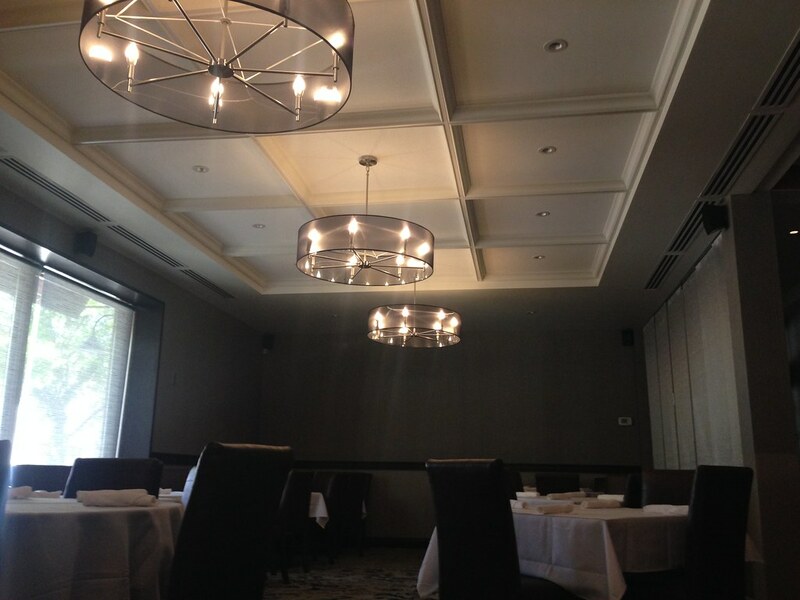 The banquet room itself was mostly a cosmetic remodel as we did not have to move any walls or change ceilings. I guess you could say that was the easy room, but even easy is a lot of work. Following our change to the banquet room we went ahead and tackled, what we call, the north dining room. While finishing the room I heard Ray make his first complaint when he said, "things are going well, but I'm just not happy when I can't turn a room around in a week!" Regardless of how long it took, the room looks great. We made more than cosmetic changes to this room as things got a little more difficult, adding to the length of construction time. We did knock down our first half-wall, tore out the ceiling and added new lighting. Those changes led to new electrical wiring, the moving of duct work and the creation of a grid for the new ceiling. Along with the physical changes to the room, we also added new chairs, with new tables on the way. So it took 2 weeks and not one, big deal! We shall see what the weather brings us for the weekend, but if we can not use outside, there is a good chance the new north dining room will be utilized for the first time. Bathroom renovation will begin soon, within a few weeks and we should have both rooms done in 1-2 weeks. It will be a pretty quick turnaround. After the bathrooms are finished we are not sure what to tackle next. We are trying to decide the best plan of attack between the bar room, the front entry way and our front dining room. The hardest part is ahead of us, but 2 phases are down. We are all getting excited and anxious for the next project. We hope you enjoy our recent changes, but understand the most exciting are just down the road and yes, they will probably take longer than a week! View additional renovation photos here.